Hello, Gorgeous! : Learning to Layer: 5 Easy Steps. Whenever someone asks me what my best style advice for Fall casual wear is, I immediately shout out "LAYERS!!". Layers, ladies. That's where it's at. Because sometimes you need a warm embrace in the middle of the day. And no one is better at giving you that hug than a layered button-up/sweater combo. And here, I will impart upon you all of my layering knowledge. 1. Wear fitted button-ups. If the button-up is not fitted, it will bunch up and look sloppy. 2. Wear button-ups that have interesting patterns or colors. It will enhance the look of the outfit and look more fun while "peeking out". 3. Wear fitted sweaters for the top layer of your layering. Many people think that the bigger the sweater, the better. Not true. The top layer almost always stretches out over the bottom button-up. If you buy a too-big sweater, it will look messy and slouchy in 10 minutes' time. 4. 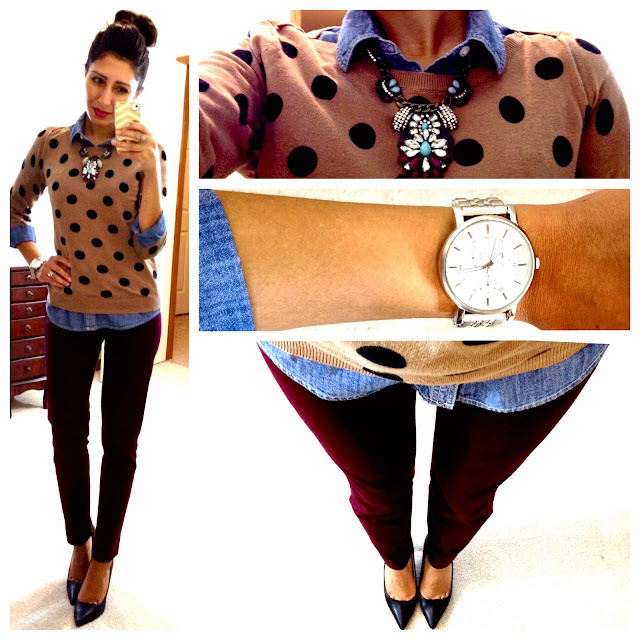 Layer some bling over your killer button-up/sweater combo! 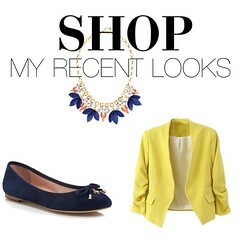 Statement necklaces, bracelets, and watches can add some serious punch to a basic layered outfit. Most layered combos look even better with a "completer" piece. 5. And as always, have fun with putting together different layered looks! Try different proportions, textures, and colors. Find out what you like and what you don't like. If you hate what you're wearing that day, it's not the end of the world. You will take it off when you get home and try something else the next day! Now that you know all that I know, go forth and layer! Hi Cassandra- it should work now! Fixed it again! Not sure what's wrong with it. Thank you! :) Good luck with your blog! I love your style! You make me feel like there's hope for working women to still be fashionable with a business professional dress code. I've always feared having a job that had a strict dress code, thinking that you would be forced to dress "stuffy and boxy." But your style defies all those preconceptions! Thank you for inspiring me! I am so glad I found your blog! I was curious as to what size you wear in the chambray shirt (I noticed it was ON girls and I'm not sure if I could fit or not). Also, the maroon Target tights are called dark red on the site, correct? I'd love to see the Merona (colorful fall staple skirt) paired with tights of some kind and I'd also like to see the two tone riding boots (fall staples) featured. Thank you for all your help and ideas!!! Super-cute looks as always. 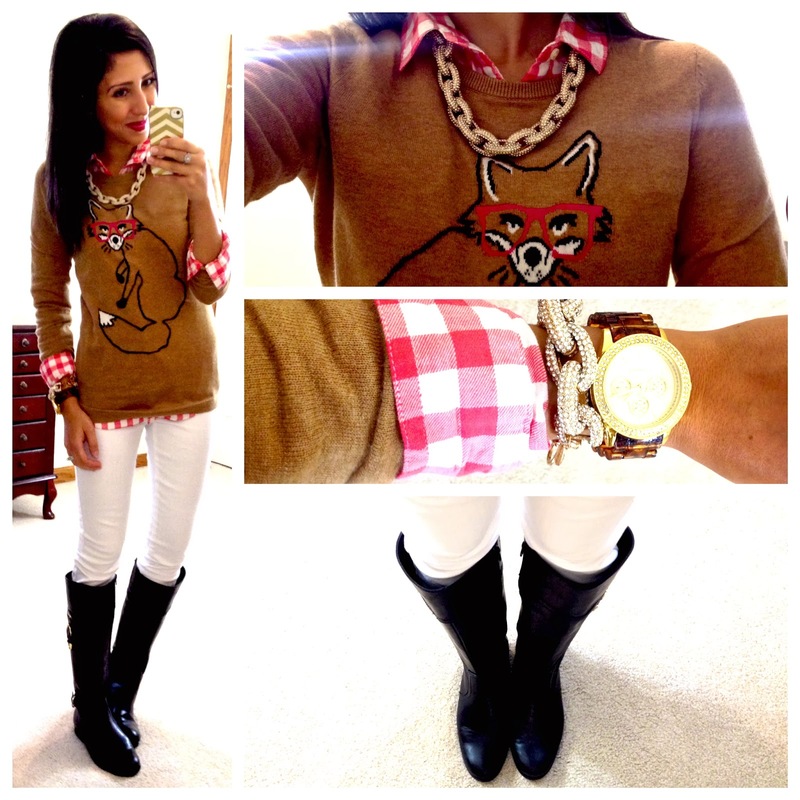 I'm in love with that fox sweater. Just adorable! These are great tips, as always! Your outfits always inspire me so much. 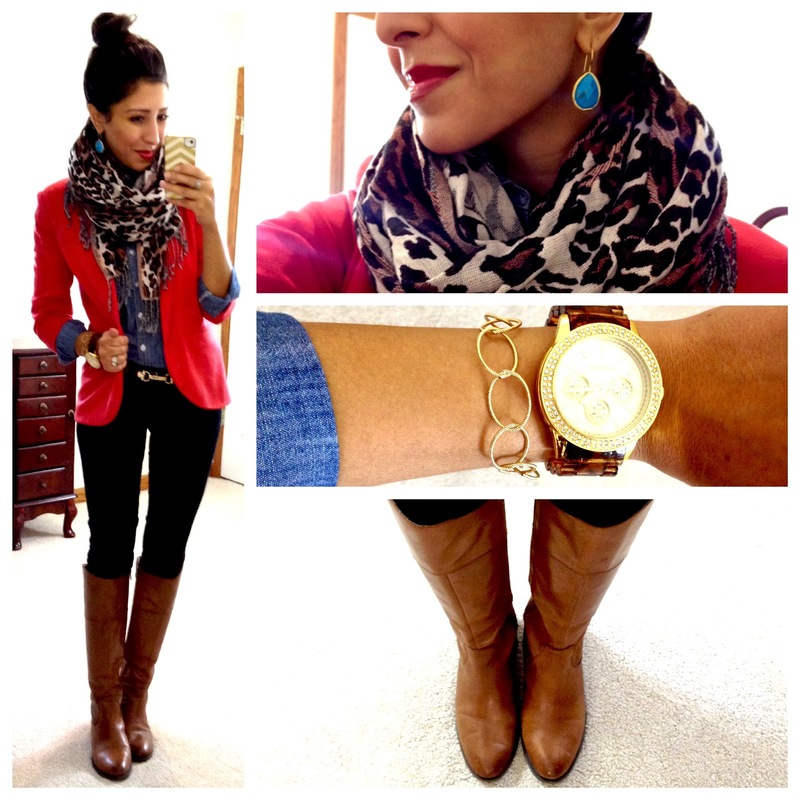 YAY for layering! :-) Great tips. I love your fox sweater post as I am wearing it layered today. Thanks for the tips on how to make it looks smooth; I was wondering how to get that look. I'm headed back upstairs to add a little bling to it. Thanks again! Where is your belt from in the last outfit? I love it! Also looking for the belt link! Võng ru tự động cho bé hay vong dua em be hay võng đưa em bé giúp bé ngủ ngon mà võng đưa tự động không tốn sức ru võng của bố mẹ. Võng tự động hay may dua vong chắc chắn, gọn gàng, dễ tháo xếp, dễ di chuyển và may dua vong ts dễ dàng bảo quản. Lợi ích mà vong tu dong vô cùng thiết thực.